COMELY CONTESTANT — First candidate for title of “Miss Pioneer Pass” is Miss Shelli Beede of La Habra and Landers. She’ll be one of many aspirants for job of official model for Pioneer Pass Golf Challenge, unique tournament between Yucca Valley and Big Bear. YUCCA VALLEY – Only six weeks away, the Pioneer Pass Camera Cavalcade slated for Sunday, July 26, is pulling camera clubs, photographers and models – candidates for title of “Miss Pioneer Pass” –from coastal cities and communities throughout the Hi-Desert, according to a spokesman for the Yucca Valley Park and Recreation District, sponsor of the event. First entry for title of “Miss Pioneer Pass” is Miss Shelli Beede of La Habra and Landers. 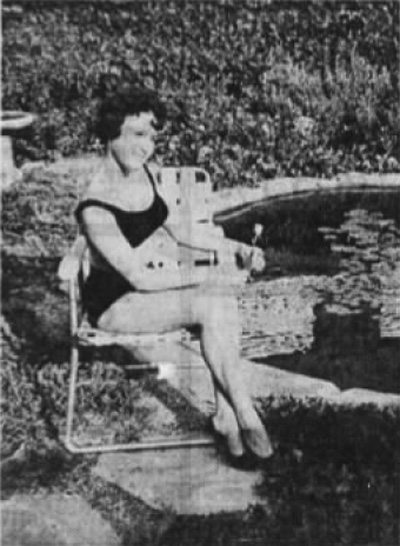 Sponsored by Kelly’s Kitchen, Miss Beede was named princess at the 1963 Landers Fun Festival, is a student at Fullerton Junior College, likes all outdoor sports and between studies, is a secretary-receptionist-bookkeeper for a Fullerton doctor. 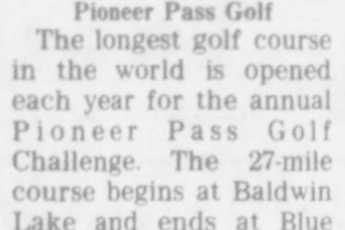 Location for the July shutterbug and model activities will be the 28-mile “19th Hole” fairway of the 6th annual Pioneer Pass Golf Challenge to be held in October. 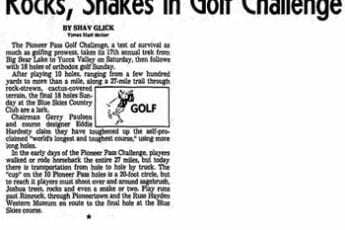 The rugged hole, billed as the “World’s Longest and Only 19th Hole” is not the Pioneer Pass road and formerly an old mining and cattle trail connecting the desert with the mountains surrounding Big Bear Valley. Photographers and the title candidates will meet at the club house at Moonridge Country Club, Big Bear Lake, at 10 a.m. July 26. Models will be briefed over coffee by Miss Georgene Bradshaw, Yucca Valley, who recently relinquished the title. Camera fans will shoot models in both color and black and white. Ten girls will be selected for title finalists from color and black and white photographs taken during PPCC field day. Photographers will also earn ribbons, first through third place in two divisions, color and black and white. Professional photographers will judge. Winning 10 finalists will be invited to the Pioneer Pass Golf Challenge press party, date and place to be announced. At the press party, date and place to be announced. At the press night before the panel of PPCC judges, “Miss Pioneer Pass’ will be named and winning photograph awards presented. 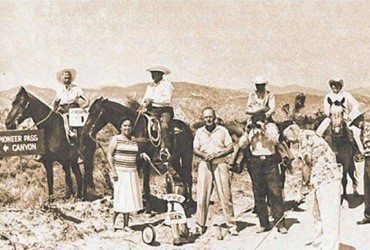 All camera clubs and photographers, as well as candidates for “Miss Pioneer Pass” title, should forward participation intentions to PPCC Chairman, Yucca Valley Park and Recreation District, Box 666, Yucca Valley. Girls should enclose snapshots and brief biography. Camera clubs should indicate number of members expected to participate. Committee in charge of the Pioneer Pass Camera Cavalcade is made up of Al Fisher, Norm Granger, Jerry Moore and Georgene Bradshaw.